Making a bento box for a picky child. My daughter likes these MUCH better than peanut butter and jelly or school lunches. 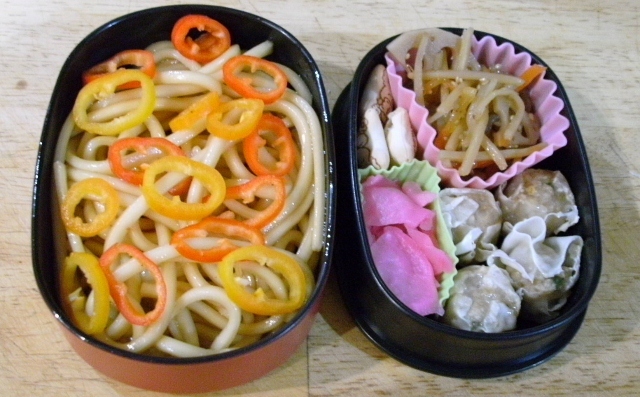 Today I used udon noodles instead of rice for the carbohydrate. I stir fried them quickly in some store bought stir fry sauce to give it a little flavor and hopefully keep the noodles from sticking together. I did rinse them very well, but you never know. It is no fun to stick your chopsticks into a bunch of noodles and have them come up as one whole piece. We are also giving pickled daikon radish a try. It should taste good with the plain fried tofu. This bento is mine. I made the apple bunnies again and the stars are the daikon pickle. Since we still have cantelope left I didn't want to waste it so I am using it again in the boxes. The little doggy pick makes it easier to eat the little melon balls than it would be with chopsticks. Today we are having an "easy" lunch. I made some udon noodles and tossed them with some sesame oil (to prevent sticking), soy, mirin and a shot of hot sauce as she has said that she likes things a little spicy. Who knew? Then I steamed some pork and shrimp dumplings for some protein. Added to that is some burdock root salad, a little pickled radish and three small cookies that we got in a gift basket from Ebisuya. 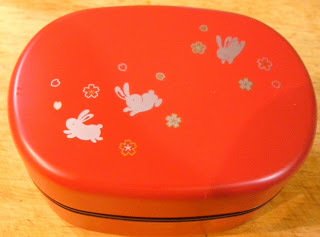 The bento box I got for a steal from Ohayobento. I also got some picks, a lamb bento and some cut flower silicon cups I can't wait to use. 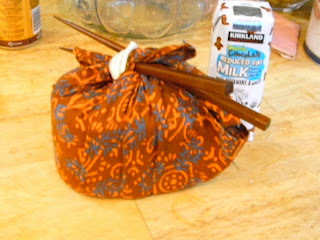 I wrapped it using the napkins I got from Ecolunchboxes a while back. Pippy is not thrilled with the stainless steel, but I love it. I am in the process of making new clothes for her bento that don't come with bags. We picked out the fabric, but now I just have to find the time and clear a space on the table to cut and press them for stitching. I am not sure if I want to use my eldest's sewing machine or do the more tradition running stitch by hand. We will see. Considering my crazy schedule I may use the machine.